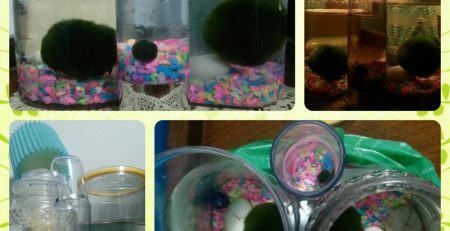 The most important aspect of caring for your marimo is the water you give it to live in. Tap water of pH 6.0-8.0 is fine but should remain between 60 and 80°F. 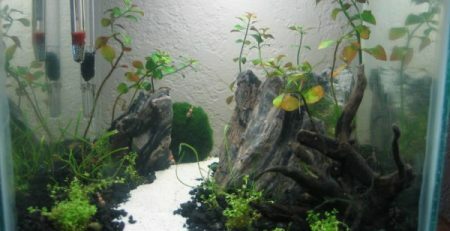 A glass tank or fish bowl is ideal and old water should be changed about twice per month. 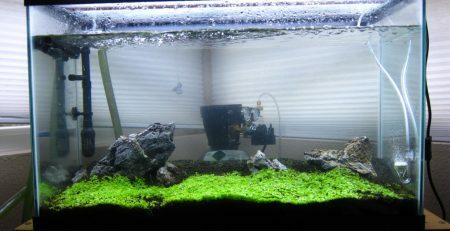 Unwanted invasions by other algae or bacteria can be deterred without use of chemicals by changing the tank water on a regular basis. 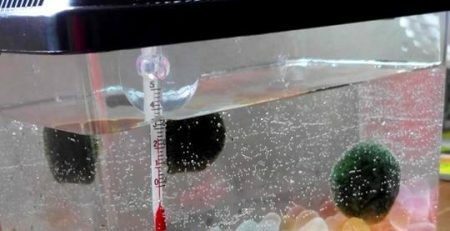 Typical indoor artificial lighting is adequate for marimo to grow and stay healthy. 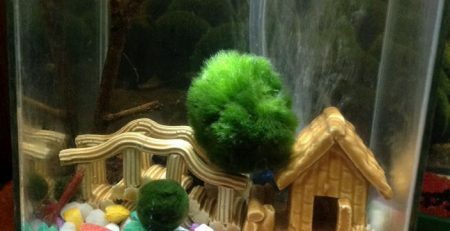 Since floating between the tank bottom and water surface is how marimo regulate their photosynthesis needs, be sure to avoid keeping the tank in direct sunlight that marimo cannot sink away from. 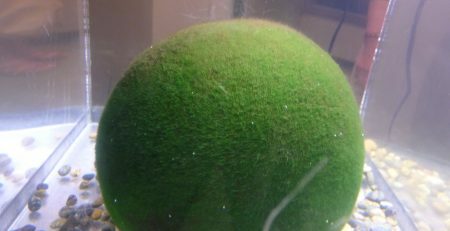 Gently rolling and shaping your marimo helps it form into a sphere in the absence of naturally tumbling in wave currents as in the wild. 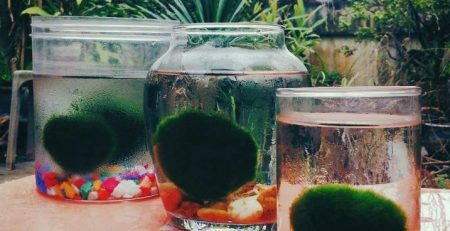 Once a marimo has grown to about 2 cm wide, bathing and rinsing it like a sponge will refresh unexposed inner cells and aiding filament growth in the core of the marimo. Plant cells without access to light, CO2+, and fresh water can’t photosynthesize so they stop growing filaments in dormancy. Though it is tempting, resisting the urge to shape small or recently formed marimos will help you avoid damaging or interrupting their initial adhesion from over-handling them. 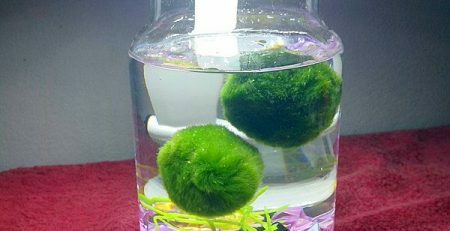 Many people purchase their marimo to have a relatively carefree pet that they won’t have to spend much money on to keep alive and looking healthy. 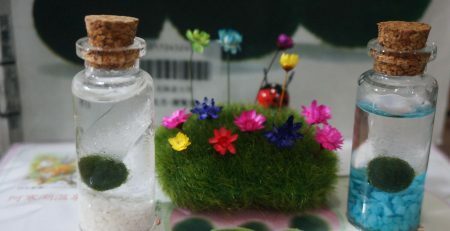 Still, some new owners become disappointed and impatient with how slowly their pet marimo is growing and are anxious for it to reach the gigantic sizes found in Lake Anuk. 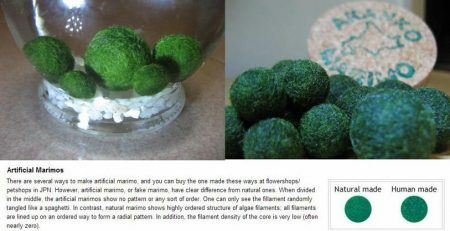 Building a full-scale replica of Lake Akan to boost your marimo’s growth isn’t really necessary since algae growth can be easily manipulated.